Which renovations offer the best return? Not all renovations give a positive return on investment – some will actually cost more than you will ever make back. Whether you’re renovating to sell now or later down the track, here’s our pick of the best. Kitchen: Experts say a kitchen renovation is one of the top investments a homeowner can make. Buyers want a house that requires minimal effort and that they can visualise themselves living in – a modern kitchen will help achieve this. A premium kitchen renovation can increase the property’s values as much as $50,000. Bathroom: Buyers now expect 2+ bathrooms as the bare minimum and want to see modern fixtures and fittings. Like the kitchen, the bathroom is one of the more complex renovations given the various trades involved, but the return can be well worth the investment. Facade: Forget what your mother told you about judging a book by its cover, because that’s exactly what home buyers and renters do. Adding to the street appeal of your home is always almost beneficial, even if it’s just a matter of repainting the front door or fence. Outdoors: Outdoor/indoor integration has become increasingly popular, particularly in Australia where the climate is not too extreme. Like the kitchen, the outdoor area is a space where buyers can visualise themselves – either playing with the kids or entertaining family and friends. Luckily, many outdoor improvements can be done DIY or with the help of handyman. Pre-fabricated or ‘flat-pack’ kitchens cost a fraction of the price of a custom built one, and you often can’t tell the difference. If you are handy with a hammer, these kitchens can also be constructed DIY, removing the cost of installation experts. Re-painting your walls and cabinets is another way to transform your kitchen without the massive price tag. If your existing cabinets are in good shape, adding a fresh, modern colour can make your kitchen look brand new. If re-tiling your walls is going to be too expensive, there’s cheaper, alternative ways to achieve a similar look. Tile paint is designed to modernise dated ceramic tiles, and is available in a range of different colours. This kind of paint is inexpensive, durable and very easy to apply (for all the DIY’ers out there). If your bathroom is looking dark and dingy, mirrors are an inexpensive way to let in new light and make the room appear more spacious. Replace small shaving cabinets with large wall mirrors, before you go installing new windows or skylights. Top of the range wool carpets are warm, durable and naturally stain resistant (big bonus). Just like you woolen jumpers, cheaper varieties are likely to pill. Cheaper than wool & even more stain resistant, nylon is a very popular carpet choice. Perfect for high traffic areas, nylon carpet will hold it’s colour for years. Inexpensive, water resistant and highly durable – polypropylene is a synthetic fibre often used for garages or playrooms.Keep in mind that polypropylene looks and feels cheaper than other varieties. Timeframe: Floorboards can take up to 4 weeks including delivery & installation, therefore you can expect a living room renovation to take 2-4 weeks depending on the tasks involved. If you’re looking to increase the visual appeal and buyer value of your living room, your main focus should be the floors and the walls. Newly painted white walls (for as little as $200) will transform the room into a blank canvas for you or a new buyer to decorate upon. Expect to increase the rooms value by 2-3%. Stripping back old carpet to reveal old timber floorboards is often cheaper and more impressive than installing new carpet. 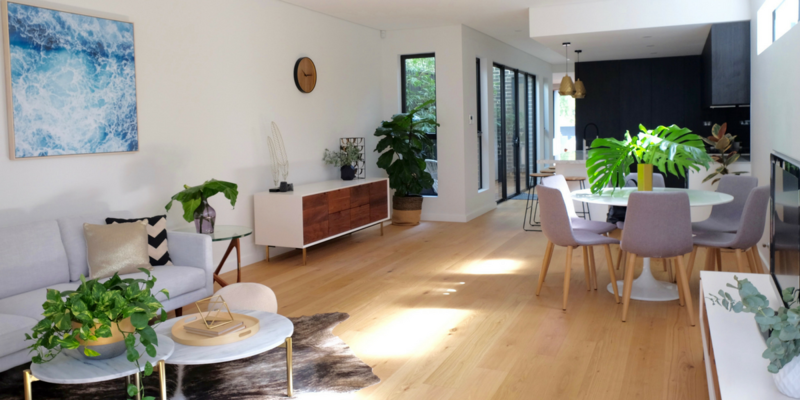 If the original surface isn’t timber, consider the cheat-method of floating floorboards which can be purchased and installed at a more affordable price – around $70/m2. We bet you won’t be able to tell the difference! While costs can vary significantly depending on the material you select, and the length of your fence, you can expect to pay from $40 -$120/m2. Timeframe: A simple garden can be created over a weekend, while structural projects like a pool can take up to 8 weeks. It might sound obvious, but setting up an outdoor lighting system will ensure you make the absolute most of your backyard area (in the day & night). Solar lights are an eco-friendly option that absorb the sun’s energy during the day and automatically switch on in the evening. There’s no point having an outdoor entertaining area if it’s not equipped to be used all night. Forget building an expensive pergola or installing outdoor awnings and go au naturale. Just like your home, the value of a tree will only increase over time. If you buy them around 2 metres tall, within a few years they will provide a beautiful, natural source of shade for your outdoor entertaining area. Timeframe: 2-4 weeks (carpet installation, painting and bed delivery will be the most time consuming elements). Even the plainest of beds can look luxe with a well-mounted headboard. If your budget is too tight to invest in an entirely new mattress and bed frame, a headboard is the perfect way to makeover your bedroom for minimal effort and cost. For the creatives out there, you can even design a painted-on version. In saying that, overshooting the budget is the most common story we hear from renovators. The best advice we can give is to be realistic when planning your budget and always factor in an extra 10% buffer to deal with unexpected expenses. 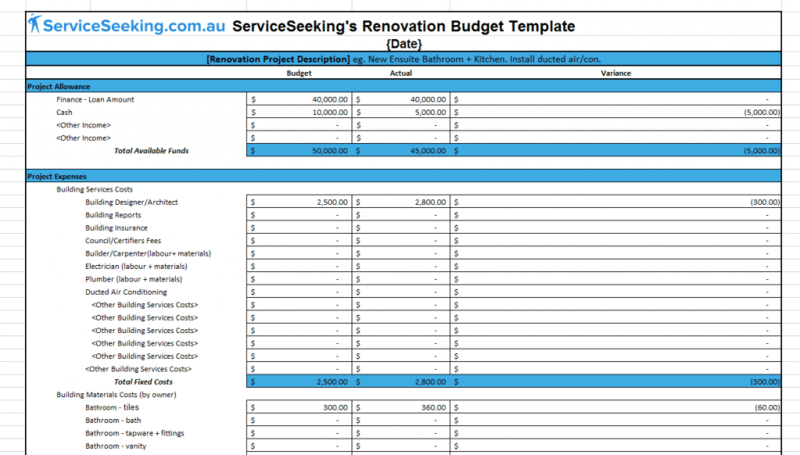 Our renovation budget template is your ultimate partner in crime – it helps you to break down the individual tasks and expenses so nothing slips through the cracks. It’s also good to make a list of negotiable and non-negotiable expenses so you end up with a result you’re happy with. The humble front and back yard is so often overlooked by renovators – when it should be one of the first considerations. Before buyers even set their eyes on your marble benchtop, they have to enter through the front garden. It sets the tone and expectation for the rest of the house. Also, buyers love to see a backyard space they can visualise themselves in, so make sure to put some thought into this area of the house. Too many times we hear horror stories from customers who have hired tradies based on no reviews or recommendations. The result? Not good! Luckily, websites like ServiceSeeking.com.au now allow you to access credible, trusted contractors in your local area. You can check reviews posted by real customers and even flick through photos of their previous work to see what kind of portfolio they have. Always ask your tradie to show proof of licence, and if they hesitate, move on.